A Reader's Adventure! : Favorite books of 2012! The Fault in Our Stars by John Green and Code Name Verity by Elizabeth Wein. Now that is not at all to say that I did not like either of these books! On the contrary I really liked both of them, but I guess since they were so hyped I expected to LOVE them. The Book of Blood and Shadow by Robin Wasserman. I really liked this book and while I thought I would like it I was surprised how much I liked it. The Girl of Fire and Thorns series by Rae Carson (I have yet to read the second but the first one was one of my favorites!) and the Shadow and Bone series by Leigh Bardugo. Both of these books were interesting fantasy worlds that I fell in love with! Nine Rules to Break When Romanceing a Rake by Sarah Maclean was m first foray into Romance and I fell in love with it and the other books in the series! 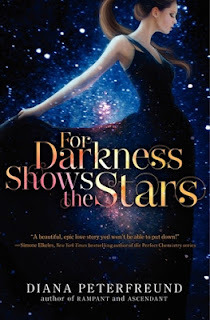 Shatter Me by Tahereh Mafi and For Darkness Shows the Stars by Diana Peterfreund. I read both of these books in a day and could not put them down. Bitterblue by Kristin Cashore because I loved it and want to read it again and again. Also The Scorpio Races by Maggie Stiefvater because it was so beautifully written and I loved the characters! This cover is so gorgeous and fits the book so well! The Scorpio Races by Maggie Stiefvater was one of the most beautifully written and lyrical books I have ever read. Code Name Verity by Elizabeth Wein, while I did not cry like many other readers, I was really touched by this story and thought about it for days after. 14.Shortest & Longest Book You Read In 2012?